Luke Townsend, left, and James Ward starred in Doncaster's win over Woodhouse Grange. Another captain’s knock from Luke Townsend guided Doncaster Town past Woodhouse Grange and into the last 16 of the ECB National Club Championship. Townsend, for the second time running in the competition, held his nerve to hit 67 not out to lead Town to a dramatic last over win in the regional final. Doncaster will now be at home to Richmondshire, of the ECB North Yorkshire South Durham Premier League, in round five on Sunday, July 15. 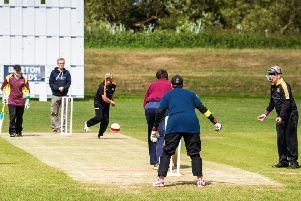 The Town Fields club are just three more wins away from returning to Lord’s, where they famously won the national knockout competition - then known as the Abbot Ale Cup - in 1998. 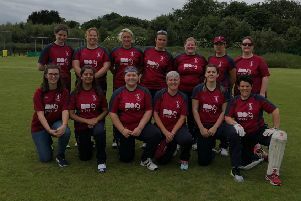 Chasing 193 for victory against their ECB Yorkshire North Premier League hosts, Town were in all sorts of trouble at 41-5. But James Ward and Townsend reignited the visitors’ hopes with a superb 120-run partnership for the sixth wicket before Ward was stumped on 51. Doncaster still required 72 runs from just eight overs with only four wickets remaining. But that was the cue for Alex Gosney to make a valuable 20 and Curtis Free struck 12 not out from just five balls, while the brilliant Townsend kept his cool at the other end to see Town home to a thrilling three wicket victory with five balls remaining. Townsend did exactly the same against Sessay in the previous round, also finishing unbeaten on 67. Free and Gosney had earlier taken two wickets apiece to restrict Grange to 192-6 from their 40 overs. Next opponents Richmondshire boast former England super sub Gary Pratt, who shot to prominence in the 2005 Ashes series, among their ranks. n James Stuart snared seven wickets as Doncaster recorded a comfortable league win at Cleethorpes on Saturday. Stuart finished with superb figures of 7-41 from 15 overs to help reduce the hosts to 145 all out. Ali Waqas struck an unbeaten 61 to guide Town to a seven wicket victory, lifting them to fourth in the ECB Yorkshire South Premier League standings. Meanwhile, Stuart has been selected to play for Yorkshire South Premier League XI against a Yorkshire XI in a T20 match on July 2.